The ninth in the hugely popular George O’Connor OLYMPIANS series is here, and it’s a must-have for those who love the Greek Gods, and especially for fans of Artemis, Wild Goddess of the Hunt. This volume focuses on several of the most notorious and bloody stories in the Artemis myth. The re-telling, as with the prior volumes, pulls no punches and holds true to the moral ambiguity of the Greek Gods. The narrator for much of the volume is Apollo, brother to Artemis. As narrator, he concentrates on three main tales: Niobe and her children, Actaeon and his temptation, and Orion and his friendship with Artemis. Despite the modern language and affect employed throughout, the stories are loyal to the classic myths, and the illustrations help tell the tales as well. First time readers may be shocked at the violence in the stories about Artemis. One man is hunted by his own hounds, a mother loses her children to Artemis and Apollo’s arrows, and Artemis knowingly kills a potential love interest in her quest to stay unattached to a suitor. But these are classic myths retold, not embellished. And the illustrations support the story without dwelling on the gory details. Animal loving readers will appreciate the attention to forest dwelling animals and the love Artemis has for them. However, the spotlight on hunting for sport and enjoyment, and the role animals play in the death in one of the stories can and should be discussed, especially with younger children. Again, for readers familiar with the Greek myths and the Olympians, this will be nothing new, but the smart and sharp treatment of the subject in this volume provides an opportunity for thoughtful notice. As with the previous volumes, the focus is on one Olympian, but other characters appear and play variously significant roles. Children familiar with the past books will delight in seeing the developments with characters they already recognize and enjoy. 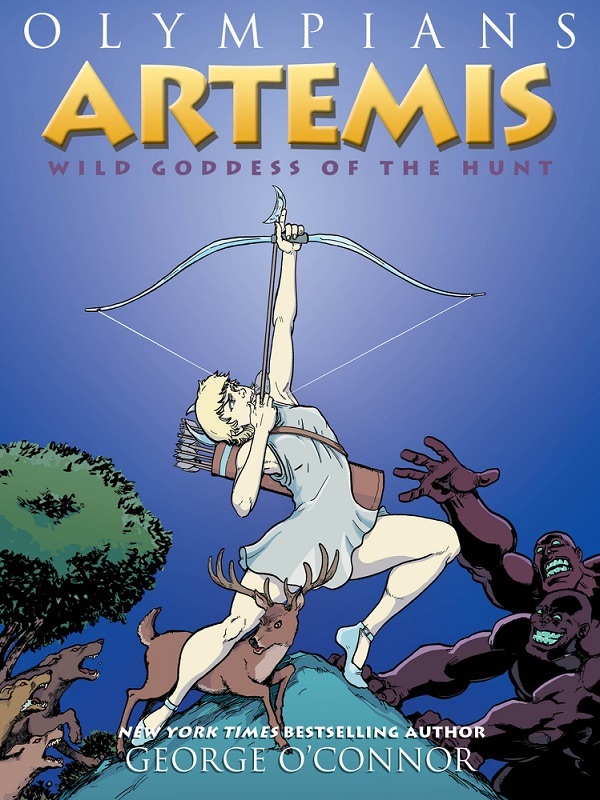 Artemis, Wild Goddess of the Hunt is an excellent addition to the Olympians series by George O’Connor.